Firebird is yet another classic slot risen from the ashes of Novomatic! It’s a simple slot game with three reels and five paylines. The name might make it sound interesting but it is anything but. Beginners will find this game a perfect choice, as will anyone who enjoys a classic slot game. Any player who’s looking for something a little more fancy can play one of Novomatic’s modern video slots, such as: Kingdom of Legend, Eye of the Dragon, Cops n Robbers Vegas Vacation or Wild Horses. 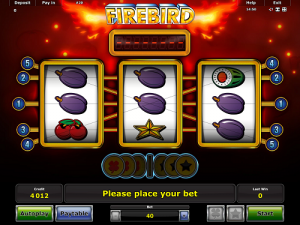 Firebird is so classic and simple that there isn’t even a Free Spins round or a bonus game. It’s just a plain slot game that is capable of delivering some big wins. Even the symbols are nice and simple! The paytable is full of all of Novomatic’s favourites. Enjoy a blast from the past with this slot game. At the end of the day, it does what it’s supposed to. The colourful reels spin, the symbols catch your eye and the wins put a smile on your face. So many casino games vendors these days are far too absorbed with making their games so fancy and complicated that they forget the essence of a slot game! What’s the point of playing a game, no matter how amazing it looks, if you always lose? Any fans of Novomatic will know that their games are good quality. The reason why this slot game is so great for beginners is because the wins are perfectly simple. In many other slots, even if you’re not a beginner, it can be pretty hard to spot wins or get to grips with the rules of the game. Especially if the game has unique features that just don’t make much sense. Luckily for newbies, Firebird is a great place to start. This Novomatic slot game has three reels, each with three positions, and five paylines. These paylines run left to right and horizontally (across the 1st, 2nd and 3rd rows) and diagonally (from top to bottom and from bottom to top). All you have to do to get a payout is to spin the reels so that they stop showing as many matching symbols as possible! Wins are paid out when a symbol lands on all three reels and on a payline. For example, to win on the first payline, you’ll have to land three matching symbols on the middle position (2nd row) of each reel. You won’t get a win if you land a matching symbol on each reel but they aren’t on a payline, like for example if the first one lands on row 3 (bottom position) and the other two land on row 1 (top positions). You’ll get used to it very quickly as it’s so simple and easy to understand! The symbols include fruit symbols, like plums, cherries, lemons and watermelons, as well as golden bell symbols and red seven symbols. You can’t deactivate any of the paylines so you’ll always be betting for symbols to land on all five. You can use the settings at the bottom of the screen to adjust any other settings, for example your bet per spin. You can play the game manually by pressing the spin button (in the middle) every time you want the reels to spin. You can click it again to stop them at any time during the spin. You can also put Firebird into autoplay, a common feature for slot games by Novomatic and other developers, too. This feature keeps the reels spinning for you so you don’t have to keep clicking and clicking! Unfortunately, as well, there is no gamble feature in Novomatic’s Firebird. Normally their games come with this feature built-in but beginners can start with this game and then move up to a slightly more complicated slot that has the gamble feature and perhaps a Wild or a Scatter symbol that also triggers Free Games. Free Games are great as they give players the opportunity to play the game without spending any money and the game can give huge wins during these built-in Free Games!